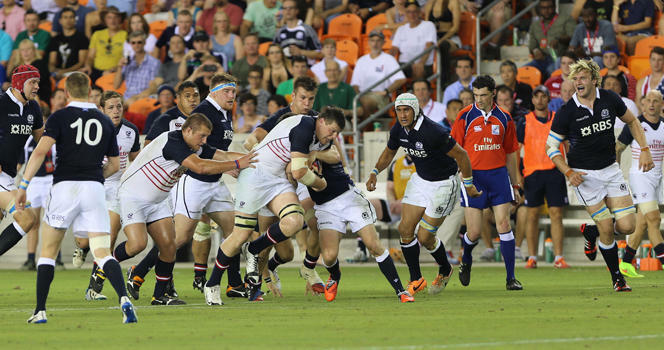 HOUSTON, Texas – The Men’s Eagles lost two players to injury in the first 20 minutes of Saturday’s match against Scotland at BBVA Compass Stadium, a 24-6 loss in front of 20,001 fans. Shalom Suniula, starting his first match for the Eagles, got the game started with the kickoff and Blaine Scully nearly won it cleanly in the air. The Eagles’ penalty troubles began in that first minute, allowing Scotland to advance up the field with kicks to touch. The lineout just meters from the Eagles’ try line in the third minute was stolen by the home team, but they were penalized before they could break midfield. Scotland captain Greig Laidlaw lined up the 40-meter kick and struck it well, but it caught the inside of the left upright and bounced back into play. The Eagles could not control the ball and a scrum was awarded for a knock. In the sixth minute, before the Eagles could get the ball out of their end, Laidlaw had a second opportunity to open the scoring with another penalty goal attempt. He did not miss, giving Scotland a 3-0 lead. The Eagles worked their way into the match with multiple phases in their attack and earned a penalty of their own in the 11th minute. It was still early, so the Eagles decided to keep it close and go for points. Chris Wyles took his time with the setup and nailed the kick to level the match at 3-3. Louis Stanfill plowed through the gain line on the other side of the restart to set up Todd Clever with a momentous run, but again the Eagles’ momentum was halted because of a penalty. The game broke open for the visitors in the 15th minute when Laidlaw offloaded to Tim Visser inside the Eagles’ half. The Eagles had overloaded the opposite side of the pitch and the wing had no trouble finding a hole with a neatly-timed run. Visser touched down between the sticks to give Laidlaw an easy conversion, which he made for a 10-3 lead. Phil Thiel went down with an apparent injury in the 18th minute and needed treatment, but Scotland moved down the pitch and almost scored a second try if it were not for a pass lost forward in the final fourth of the field. Tom Coolican replaced Thiel in the 20th minute and Folau Niua came on for Andrew Suniula, who appeared to land awkwardly in a tackle a minute earlier. Suniula was eventually taken off of the pitch on a stretcher. Scrum after scrum moved Scotland closer to the in-goal, but the Eagles held firm before holding up a try in the 27th minute. Two minutes later, Visser got the ball over the try line again. The referee did not signal a try and referred to the TMO, whose replay showed the wing lost the ball before it hit the ground. Scotland had been playing an advantage, however, so the Eagles were not able to escape the danger. Another held-up try kept the score close, but a yellow card for multiple infringements against Olive Kilifi at prop would prove costly. Nick Wallace replaced Hayden Smith as a front-row sub and managed to keep the scrum alive for the Eagles, but the referee awarded a penalty try a minute later. Laidlaw’s conversion from in front was successful to extend Scotland’s lead to 17-3. The Eagles did not bow their heads after the try and went back to work, regaining possession following the restart and pushing deep into Scotland territory. Cameron Dolan put the Eagles within striking distance and Scott LaValla helped Clever near the try line in the tackle. The captain stretched over the try line and put the ball down, but a second look at the replay gave the referee reason to keep the Eagles at three points: an infringement for double movement. Clever said the disallowed try “took the wind out of [the Eagles’] sails,” but Scotland did not capitalize and, with a missed penalty goal by Wyles, took the 17-3 lead into halftime. Kilifi and Smith reentered the match before the end of the half, but Wallace came back onto the pitch at halftime as a substitute for Eric Fry. Niua saved a near-try in the 45th minute, taking Sean Maitland into touch when the wing had room to run. Mike Petri broke the line after the lineout and the Eagles put together a few phases before kicking for territory. Seamus Kelly laid out a Scot to turn over possession in Scotland’s half and the Eagles gave Wyles a third shot at the posts in the 50th minute by earning a penalty. Wyles kicked the ball true to cut Scotland’s lead to 17-6. More stop-start play kept either team from continuous attacks, and it was not until the 66th when the next points were scored. Suniula kicked a perfect, 50-50 ball for Scully at Scotland’s 22, but Stuart Hogg timed his jump just a bit better than the Leicester Tiger and finished the turnover by running the length of the pitch for a try in the corner. Laidlaw kept his kicking average high with the tough conversion to give Scotland a 24-6 lead. The Eagles did not give up until the final whistle, but temperatures above 80 degrees and a physical encounter with the Six Nations side made it tough in the final minutes. Chad London entered the match as a blood sub for Clever, who had been cut above his eye, but more scrums advanced the clock to 80 minutes before the Eagles could score a try. Not long after the captain took the pitch once again, the referee blew his whistle to mark an end to the 24-6 match. Positive signs for the Eagles included keeping Scotland scoreless while down a man in the first half and keeping the visitors scoreless for 20 minutes in the second half, but failing to score for the second consecutive match in Houston is a worry. The match was Scotland’s first in a four-match tour, and new coach Vern Cotter was impressed with the effort from the Eagles. The Eagles had gone four matches unbeaten headed into Houston with wins against Georgia and Russia before a draw and win against Uruguay in the IRB Rugby World Cup 2015 Qualifier playoff series. The Eagles will get a chance to add more tallies to the win column this month as they take on Japan at StubHub Center June 14 and Canada at Sacramento’s new Bonney Field June 21.